The Colibri is one of the smallest and most colorful birds. It flies straight to the essence in order to get nectar out of flowers. It is the only bird that can fly backwards, straight up and can stay still while flying. Some species fly every year from South America to Canada and back home. The colibri is very sensitive. Whenever the energy does not feel harmonic it takes off. The colibri has the highest metabolism of all animals. At night when food is scarce, it slows down their metabolic rate just to conserve energy. 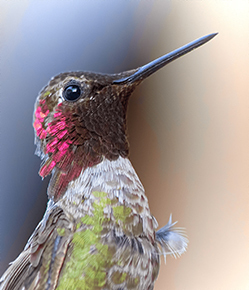 To protect its surrounding the colibri is very aggressive. The bird teaches us that it is ok to know and to protect your boundaries. To stand up for yourself. It also shows us that in life there are always new opportunities. Evolution goes forward, not backwards. The colibri is not scared of its journey and knows how to get everything out of life. Do you?